Most of this report was researched, written, and edited by Hae-in Lim, Bojan Perkov, Renata Avila, Ellery Roberts Biddle, and Sarah Myers. Global Voices Advocacy's Netizen Report offers an international snapshot of challenges, victories, and emerging trends in Internet rights around the world. This week's report begins in Morocco, where authorities arrested a journalist for his coverage of a controversial online video. Ali Anouzla, editor at Moroccan news website Lakome.com, was arrested allegedly for writing about an online video entitled “Morocco: Kingdom of Corruption and Despotism.” Sources have attributed the video to al Qaeda. 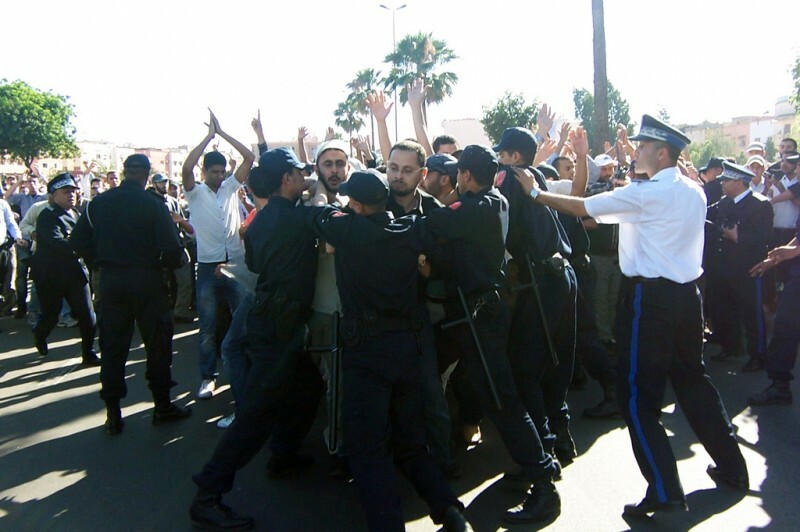 According to Human Rights Watch, authorities said the video “contained a clear call and direct incitement to perpetrate acts of terrorism in Morocco.” Police arrested Anouzla at his home, where they seized documents and some electronic equipment. Charges against him have yet to be made public. The Electronic Frontier Foundation published a useful analysis of the situation, taking into account Morocco's unique legal environment. In China, prominent entrepreneur and online commentator Charles Xue, who was detained in August on prostitution-related charges, admitted to being an “irresponsible opinion leader” in an interview [zh] with state-run television station CCTV. In the interview, which has aired repeatedly on CCTV, Xue expressed support for the government's current campaign against online “rumor mongering,” which has targeted a wide range of individuals and companies that have been critical of the government online. Netizens described dismay and disappointment with the interview, with many agreeing that it would have a chilling effect on Internet activism in China. With the Chinese government's ongoing assault on unsanctioned Internet activity, billionaire activist Wang Gongquan was also arrested and detained on suspicion of “gathering crowds to disturb social order.” A number of Chinese bloggers on Sina Weibo are trying to “unverify” themselves in order to avoid targeting by the government. Facebook and Twitter, which have been blocked in Iran since 2009, were briefly accessible in the country on September 16. Although some hoped this was a sign of change with the new administration, the sites were blocked again later in the day, indicating that it had been caused by a technical error. The Atlantic analyzed potential causes for the glitch, which some have interpreted as being caused by political infighting. In Ecuador, the executive branch proposed a set of reforms that would regulate libel and slander on social networks. Alexis Mera, the president's legal secretary, pointed out in an interview with El Comercio that libelous or slanderous speech could “do much more damage” when tweeted by a person with ten thousand followers. Amidst recent controversy regarding Wikipedia Croatia, in a statement to Croatian daily newspaper Jutarnji list, Jimmy Wales said [hr] that there shouldn’t be two separate versions of the popular online encyclopedia (Serbian and Croatian) in the Balkans. Right-wing administrators of the site had allowed content that many users considered to be biased and nationalistic to be on Wikipedia Croatia without proper warning. Facebook users have created a page condemning “pro-fascist articles” on Wikipedia Croatia. Canadian telecommunications companies seeking wireless spectrum licenses are required to provide the Canadian government with the capability to monitor devices using their networks. Among various other standards, the government requires that “Any type of encryption algorithm that is initiated by the service provider must be provided to the law enforcement agency unencrypted.” In the Globe and Mail, director of University of Toronto's Citizen Lab Ron Deibert, called on Canadian telcos to shut the so-called “backdoors”, which not only give government agents easy access to citizens’ data, but leaves that data vulnerable to attack by other more malicious actors. Brazilian President Dilma Rousseff called off a visit to Washington, DC, because of recent revelations that the National Security Agency spied on communications within the Brazilian government and national oil company Petrobras. Brazil is exploring ways to make its use of the Internet less dependent on US-based services, including forcing Internet firms to open data centers in Brazil. Internet Insecurity: Gmail is for terrorists? With support from Hivos and the Digital Defenders Partnership, the Media Legal Defence Initiative (MLDI) is launching a legal defense fund for South- and Southeast Asian bloggers, who increasingly face prosecution for libel, defamation, undermining national security, or fomenting unrest. The fund will provide legal representation for the bloggers and pay for legal resources for defense lawyers.